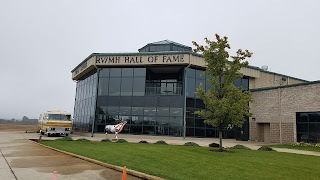 While waiting for our Newmar coach to be serviced, we were able to explore the area a little bit and experience some of the places we had been told about by other RVers. In this post, I'm going to list places we went and tell you a bit about them. When you've got nothing better to do, go sit in the Customer Service Lounge. I described the lounge in Nappanee Part 1. We enjoyed sitting there and talking to others who were waiting. We also went next door to the parts department and were able to pick up a spare pair of windshield wipers, a water filter, extra LEDs, extra matching floor tiles, and a few other things. Items in the Parts Store may be hard to find when you're on the road (like the spare wipers), so we decided to get them while we were there. 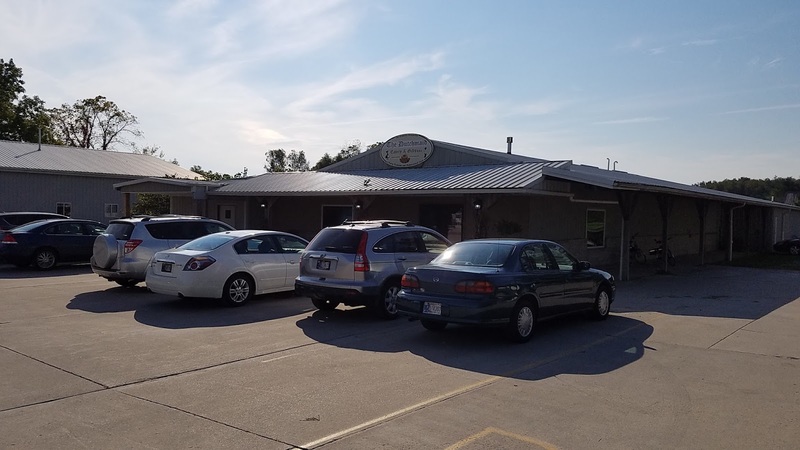 The Klub is very close - on Delaware Street next to the overflow parking area (and about 1.5 minutes from the service center and FHU parking area - everything is close!). You can go in, say hi and pick up the latest issue of the Klub's magazine "Konnections". They also sell apparel. They're only open until noon, though. Be sure to go in the morning. Between the FHU area and the overflow area on Cheyenne Street is the place where you can go to take the 10am or 1pm plant tours. They ask that you arrive 15 minutes before the tour so that you can fill out a short form, don your safety vest, put on safety glasses and headphones, and clip a receiver to your belt. 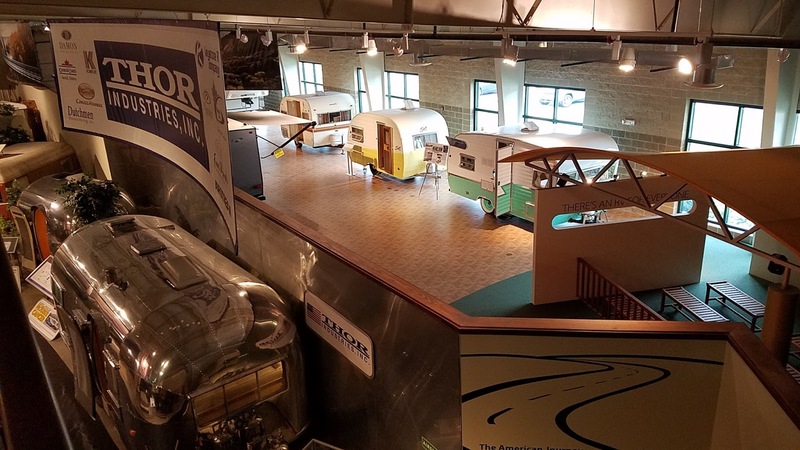 You can also go into a room where you can see a cross-section of a typical Newmar RV wall, roof and floor and view all of the fabrics and color schemes for the latest model coaches. The person who gives the tour then talks to you for about 10 minutes and makes sure that you can hear her through the headphones before you walk a short distance across the street and start the tour. Tour groups range from 1 to about 20 people, with the more crowded tours being the ones in the morning. While there, we took a 10am tour one morning and then the 1pm tour two days later. In the morning tour, you see the workers actually putting the coaches together, whereas the afternoon tour often happens in the absence of workers because they're heading for the parking lots shortly after 1p. Sometimes, if the afternoon group is small, the guide may let you walk around the coaches more. At 10a, it's harder because you'll be in the way. During the tour, they ask that you don't take photos or videos. You are also asked to stay within a path on the floor that is outlined with yellow lines. Stay close to the guide because you'll want to hear what she's saying and the transmitter starts to lose its signal if you're about 20 feet away. 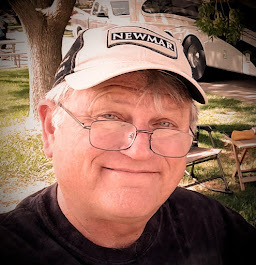 All Newmar coaches are built in Building 7, which is between the FHU parking and the overflow parking right off of Cheyenne Street. Inside the building, rigs are literally pushed from one station to another in a u-shape around the inside perimeter of the building. Chassis are prepped in a building across the street and driven over to the plant. It's strange seeing a guy sitting on a stool driving the chassis across the street. The tour takes about an hour and ends with some free time outside the factory door where you can walk through some new coaches that are being cleaned up after quality inspection. Whenever you're ready, you can walk back to the tour office and turn in your gear. Reservations aren't required for the tours. Although the afternoon tour may sometimes afford better opportunities to walk closer to some of the in-progress coaches, we preferred the morning tour because you can see much more of the actual construction because the workers are there. 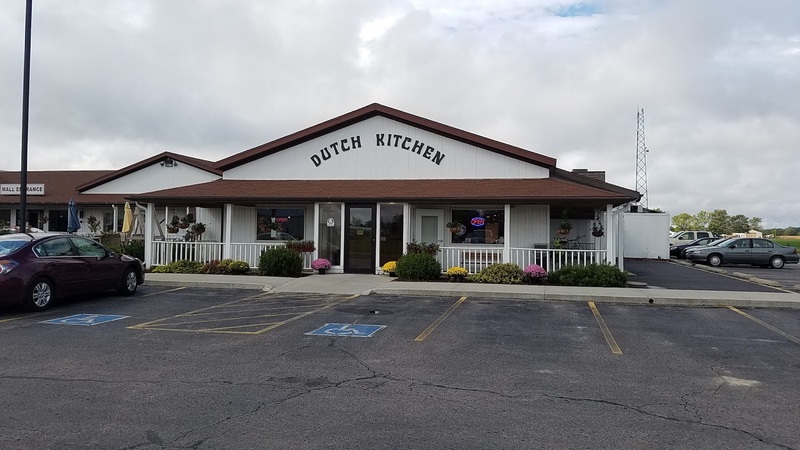 The Dutch Kitchen is a restaurant that is about a quarter mile away from Cheyenne Street and only about a 2 or 3 minute drive from the FHU parking lot. The food is good, and they have a breakfast and lunch buffet on Friday's and Saturday's. It's the closest restaurant to the Newmar facilities. It opens around 6am, 5am on Fridays and Saturdays. 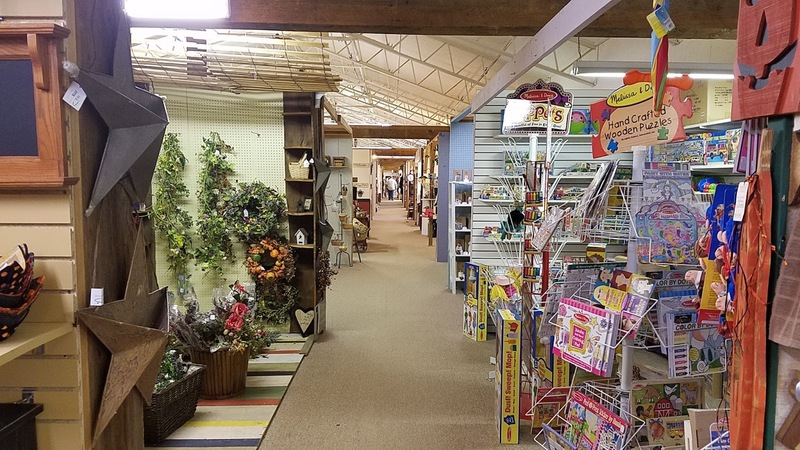 In the same building as the Dutch Kitchen is the Dutch Village, a consignment market with three long isles of booths where you can find all kinds of trinkets, decorations, clothing, and things for the home. Amish Acres is a complex on the east side of the Newmar service center, right at the corner of Alcott and the main road through town, US 6. You can drive from the FHU parking lot to Amish Acres in about two minutes. They have a family-style restaurant that serves (you pick two) chicken, ham, roast beef and turkey. They also bring out beef and noodles, mashed potatoes, green beans, bean and ham soup, rolls, cole slaw, and more. The $18.95 per person price includes your drink and dessert. As you enter/exit the restaurant, there's a gift shop with all kinds of baked goods made every morning. They also sell pre-made (dry) soup fixin's so that you can take them back and cook them later. Amish Acres also has a round barn theater; that is, a theater in a round barn. 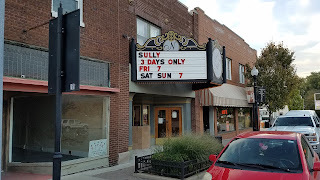 It's quite the setting for a theater production and the plays we saw (two of them, including Fiddler on the Roof) were okay, even with a sound system that is in serious need of improvement. Between the restaurant and the barn is another shop; I forget what they sell. Ticket prices for the plays are about $29, but there are discount coupons at the Customer Service Office for some savings on the meals. You can save about $10 when you buy two dinners. There is a small grocery store on US 6 that we first believed was the only store in town. Later, we discovered Martin's Super Market across the street, which is very much like a large Ingles. There's a deli, Starbucks, and everything you'd expect in a large grocery store. When you leave the FHU parking lot and turn left going east towards downtown, you'll pass three stop lights before you turn left just before the McDonald's to get into the Martin's parking lot. It takes about 8 minutes to drive there from the FHU parking lot. From the FHU lot, go south to US 6, turn right and go down a couple of miles or so. Look for signs that tell you to turn left to Rentown. Follow the signs. 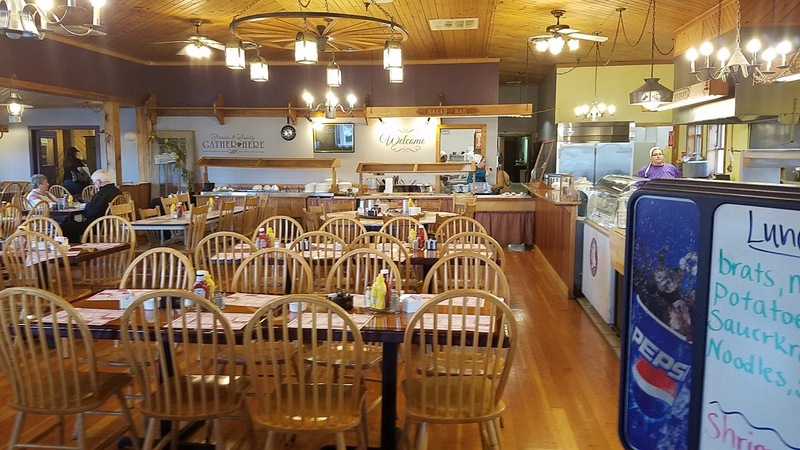 You'll end up at a grocery store (with lots of baking goods and local produce), a furniture store, and a nice restaurant called The Dutchmaid Eatery. My wife absolutely loved the food there. When you leave the FHU lot and turn left (east) on US 6, you'll go to the downtown area. The center of downtown is the intersection of US 6 and US 19. Just before you get to that intersection, look closely at the stores on your left and you'll find El Cielito's. 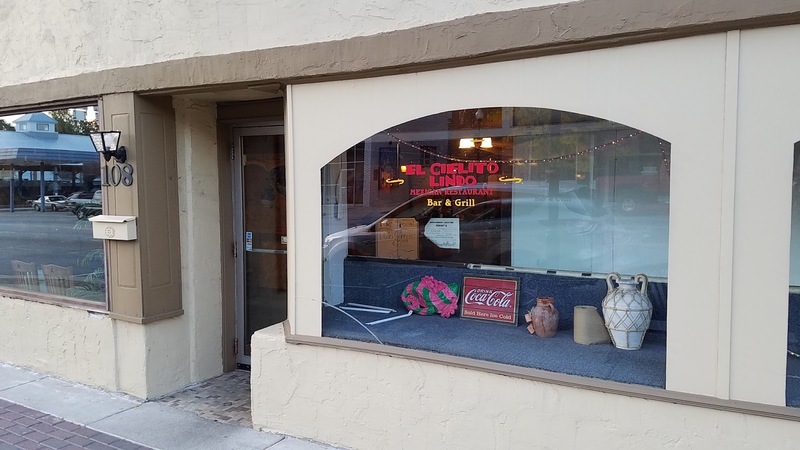 El Cielito's serves typical Mexican fare and, like most Mexican restaurants, has a large menu. We went on a Thursday night about 6pm and the place was packed. We had to wait about 15 minutes to get a seat. The service was adequate (they get your order and bring your food), but they were so busy that there was no time for idle chit chat (like "Welcome! How are you doing?"). The food was good and so were the prices. 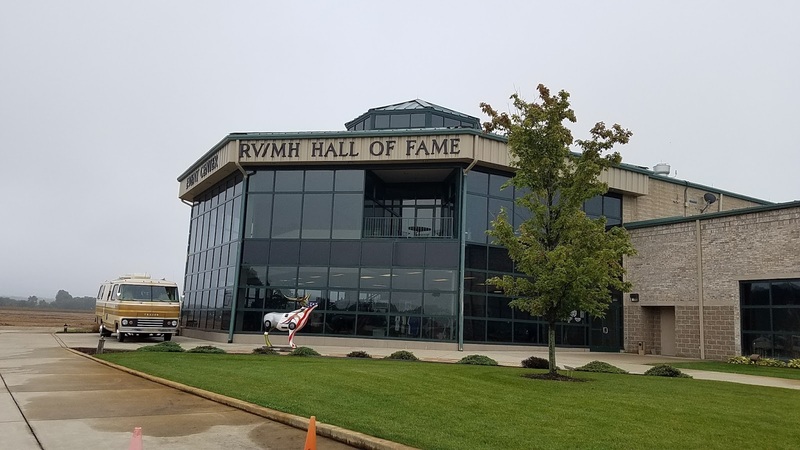 The RV Hall of Fame and Museum is a must-see if you're interested in RV's and RV history. Follow your GPS. In general, you'll be going to Elkhart. The museum is about 35 minutes or so from Newmar. 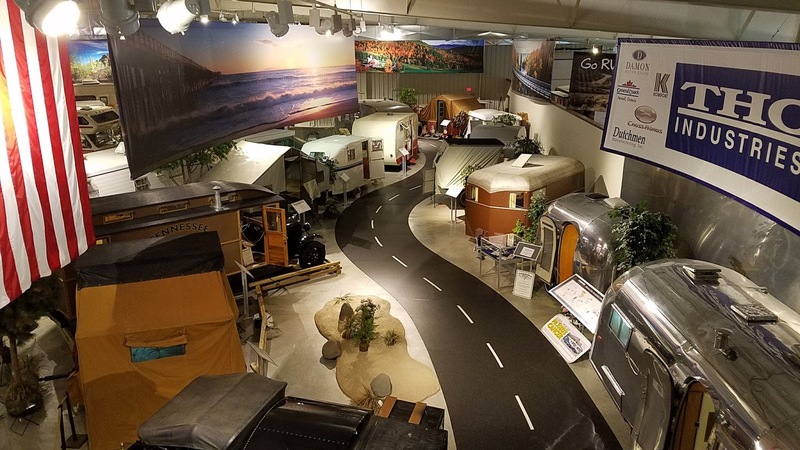 The museum has a lot of vintage RV's, many of which you can walk through. There's a sizeable gift shop and a huge RV library on the second floor. Plan to spend about two hours or so at the museum. If you want somewhere to each on the way there or back, look for the Stacks Pancake restaurant along the way (left side going, right side coming back). Rise and Roll is a donut shop and bakery. The locals love it, and it's within two miles of the FHU lot. Go towards town and turn left on US 19. Drive a couple of miles. It's at the corner of County Road 50 and US 19. They open at 7am, and may be out (so we heard) of some favorites by 1pm. A fellow RVer we met at the service lot couldn't stop talking about their Bavarian donuts. We enjoyed a cinnamon roll and a caramel donut. 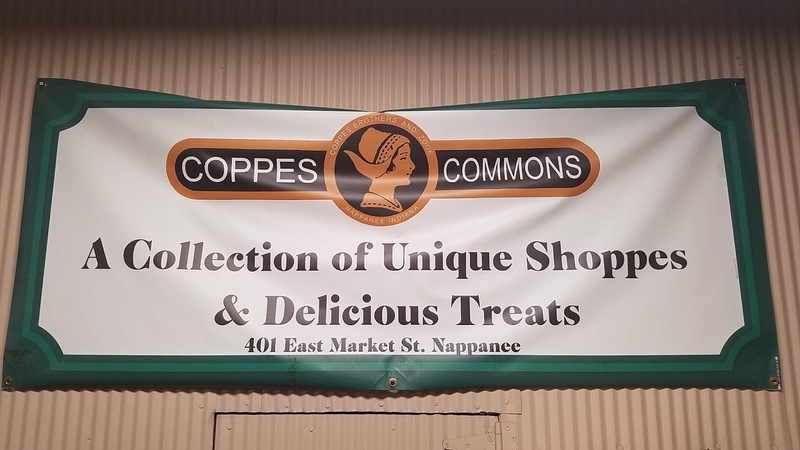 Coppes Commons is a large building that was formerly used to build Hossier cabinets. It's a large brick structure on US 6 just past US 19 on the right (if coming from Customer Service). Inside, you'll find a grocery store where you can buy bulk cooking items (like rice, etc.) 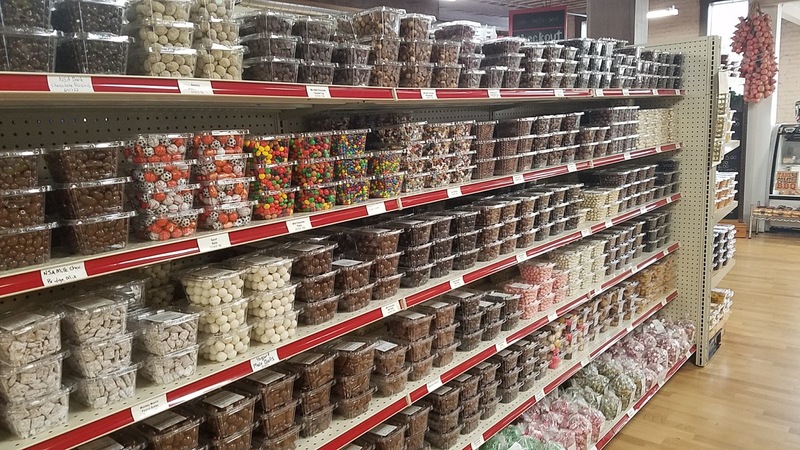 and tons of containers of things like chocolate covered almonds. The store includes a counter where you can order BBQ (with a seating/eating area). 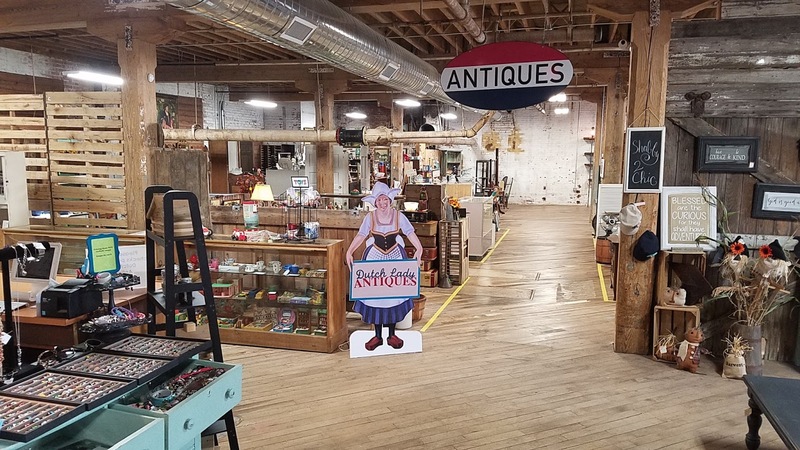 There are several other shops within the complex, including an antiques store, card shop, and a second-floor museum displaying all kinds of vintage Hoosier cabinets. 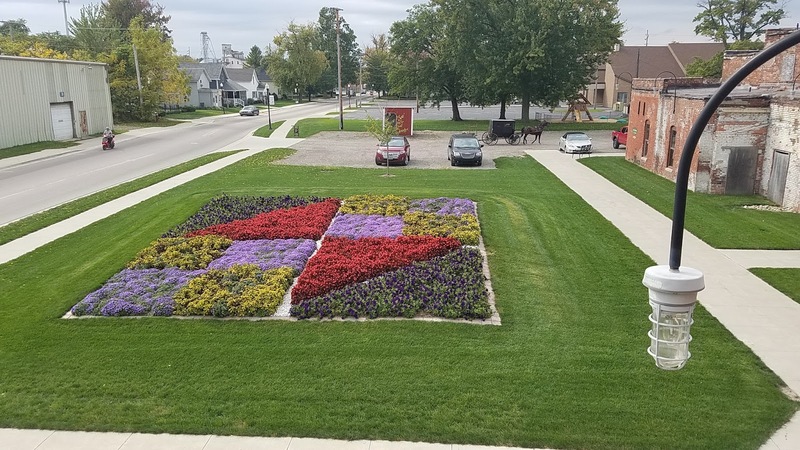 Outside Coppes Commons is one of five quilt gardens in the area. You'll have to go to nearby cities to see the other ones. 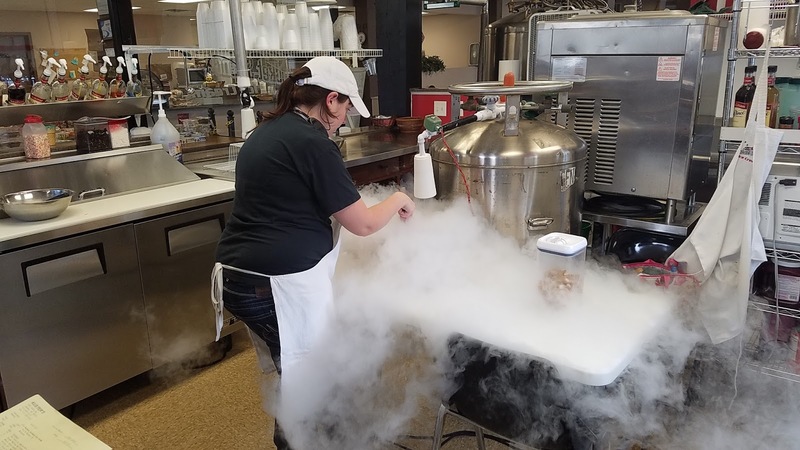 One of our favorite stores in the Commons is Rocket Science Ice Cream. Cream is poured into a bowl, flavorings and other things you request are added (like oreos, almonds, etc. ), and then they mix it using nitrogen to freeze it as they stir. The result is some really good, smooth ice cream. 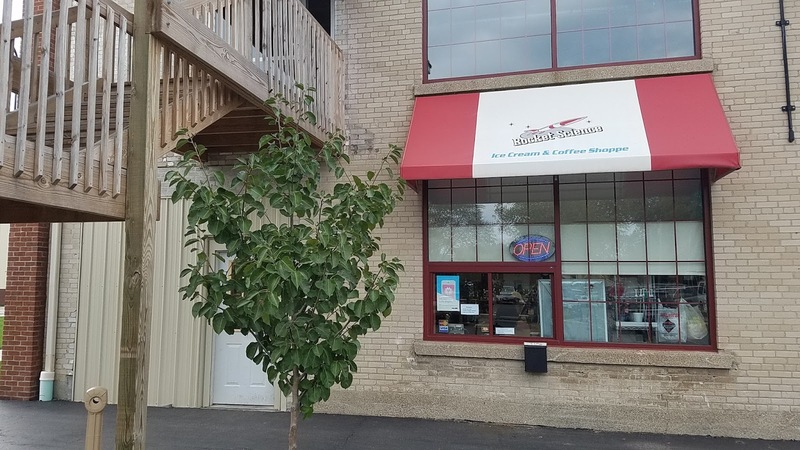 We didn't go to any of these places, but there's an Italian restaurant about four minutes away (towards town), and Nappanee also has a Dairy Queen, Burger King, McDonald's and a few pizza joints. All of these are on the main road (US 6). Just turn left (east) when leaving the FHU lot and drive until you see them. They are all within 8 minutes of the parking lot. Yep. 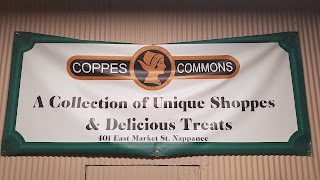 Nappanee has one. We didn't go there, but it's just north of downtown's main intersection (US 6 and US 19). It only has one showing each day on Friday, Saturday and Sunday. You gotta love that Rocket Science Ice Cream. By the way... There is also a quilt garden next to the Dutch Kitchen. Really? The DW would have liked to have seen that one. We only saw the one at the Commons.